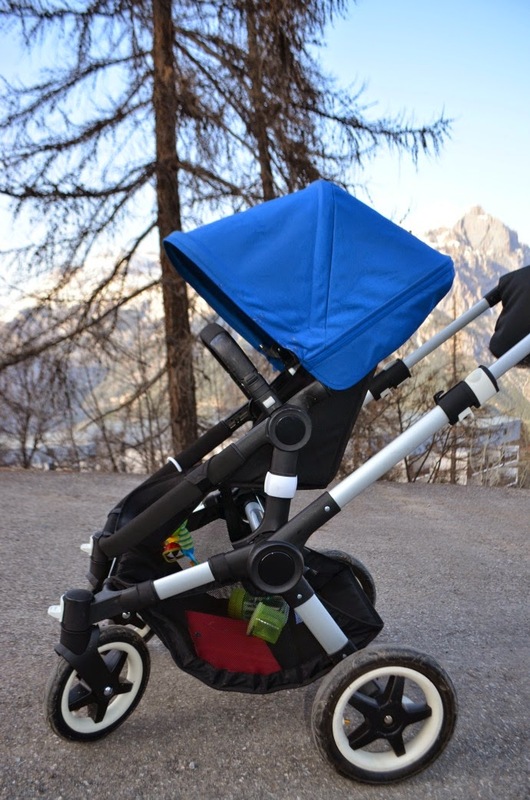 The Bugaboo Buffalo is an all terrain pushchair with big air filled tyres, a spacious seat and the biggest basket we have come across on a pushchair. It seemed the obvious choice for us to take on our family ski holiday and it definitely served it's purpose well. 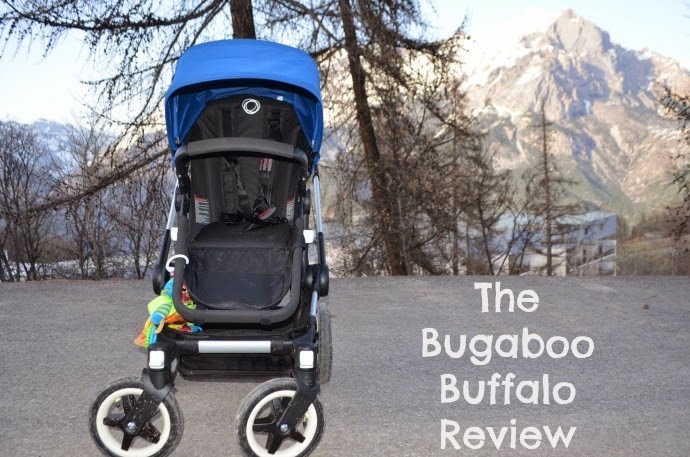 The lovely people at Bugaboo loaned us one of their lovely Buffalo puschairs, complete with a blue hood, high performance footmuff and a travel bag and it was the perfect way for Archie to travel. The Buffalo has a very spacious seat and can hold children up to 23kg rather than the usual 15kg, which was perfect for us as Dylan is not a small toddler but there are still times when he needed a rest and he was more than comfortable in the Buffalo seat. Archie is 13 months and quite an average size but didn't look drowned at all in the seat which was lovely. The all terrain wheels handled everything we tried, from a gravelly park to a snowy mountain. Although most of the paths were cleared, there was still snowy sections and we had no problem guiding the stroller over the white stuff. As we were there off season, we actually didn't get much use from the hp footmuff, and managed to come back from a week in the snow with a tan but it was amazingly thick and if we returned during the colder weeks I would definitely want one of these keeping my baby warm. I have never come across a pushchair with a bigger basket and it had no problem carrying everything we needed. 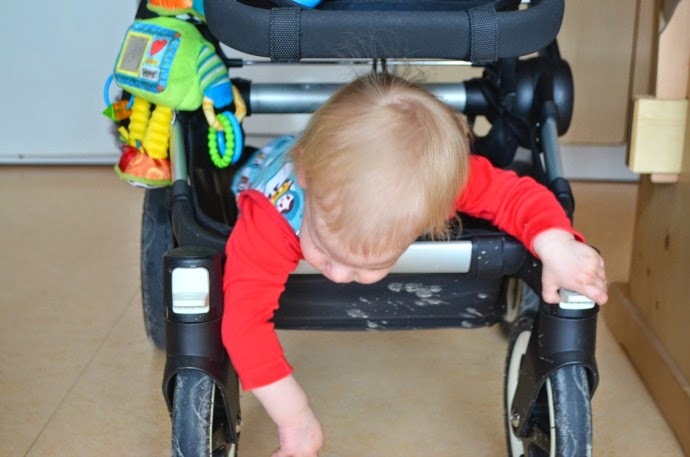 I managed to fit a nappy bag for two, snow boots for two and snow suits for two under the seat as well as both the boys' packed lunches and drinks when we dropped them at the creche and Archie had fun testing whether it could really be a double buggy. In fact of all the things we took with us, the Buffalo seemed to be the best toy he could find! As the seat is lovely and high, it made our time in the airports easier as we could use the pushchair as a high chair. We kept it in the airports and only put it in the travel bag when we got to our gate which was wonderful as we had a lot of hand luggage that I didn't want to carry around! I did find there was a bit of an art to getting the puschair apart and safely zipped up, but when you do it right it went in easily with space as well. Two wheels have to come off and the seat unit comes off from the frame but it only takes a few minutes and even less to put it back together. In the travel bag the Buffalo was bigger than our suitcases but there is no weight or size limits on pushchairs on airlines and it was incredibly easy to travel with thanks to the handy wheels and a handle. The Buffalo is a top of the range stroller and I would definitely invest in the travel bag to keep it safe if I was flying. Everything was adjustable from the handle height (which I didn't have on the tallest setting for once! ), the recline, the hood which extends and the seat which can face either way and is incredibly easy to change. The Buffalo is easy to customise with new hoods and footmuffs. The puschair also comes with a two year warrantee. Disclaimer: We were loaned this pushchair for our trip but I have not been compensated in any way for this post. They are awesome aren't they? I love our bugaboo although we have the bee it looks very very similar to this one. I would have killed for the travel bag but they are spendy even second hand. It's great quality though and last forever. I have had ours for almost three years now and it still looks brand new. :) Great review hun.